An expertise wine for eternity, with an exceptionally long maturation time. 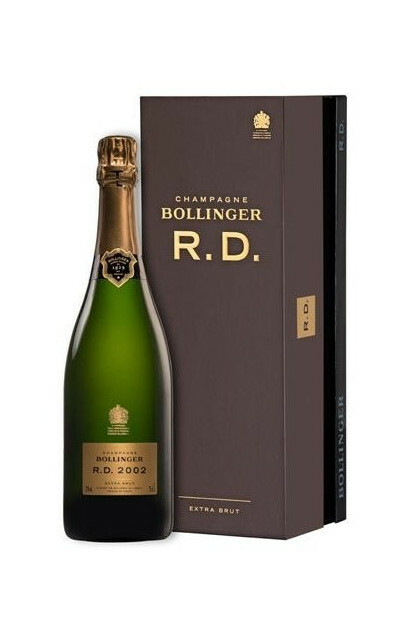 The Bollinger RD vintage (which means recently disgorged) is a blend of 60% Pinot Noir and 40% Chardonnay, from several plots meticulously selected, of which 71% are classified Grands Crus and 29% Premiers Crus. Only the best vintage years are selected by the House to benefit from an extended ageing process in the House’s chalky cellars. The colour is a very sustained aged gold. To the nose, this vintage offers ripe fruit aromas, that evolve on gourmet touches of honey, brioche pastries, and cocoa. To the palate, the attack is wide and well-built with a lingering finish. Great vinosity combined with freshness. The finish is marked by a lemon note with great bitterness. Ideal as an aperitif and with white meats like Bresse chicken or orlov veal. Perfect with patties or baked bass or wild salmon from Scotland. Great potential of ageing, bottle laid flat in a cool cellar and away from noise and light.